You are here: Home / Soccer Mind Podcast / How Do YOU Assess Your Soccer Performance? How Do YOU Assess Your Soccer Performance? Welcome to episode 6 of Soccer Psych Insights, your soccer mental training podcast. On this episode, Jaki Hitzelberger, MA and Dr. Patrick Cohn talk discuss how soccer players often assess their performance as “good” or “bad”. Dr. Cohn and Jaki Hitzelberger talk about how this can hurt confidence. Many soccer players who have high expectations and are perfectionists only focus on the negative aspects of their performance after a game. In addition, many soccer players discount what they did do well. 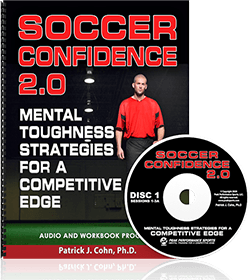 Our goal in working with soccer players is to help them assess their performance objectively. This means identifying what they did well and what they want to improve on. This is different then saying you had a “good game” or “bad game.” We want our soccer players to acknowledge their strengths and in addition, identify what they want to improve. Soccer is a game of constant improvement and mistakes are inevitable. Avoid dwelling on mistakes by adopting a more effective approach to how you assess your performance. If you have a question for us, please visit our Contact Us Page and submit your question, we will do our best to answer your question in our Soccer Psychology Articles or on our soccer psychology podcast, Soccer Psych Insights. 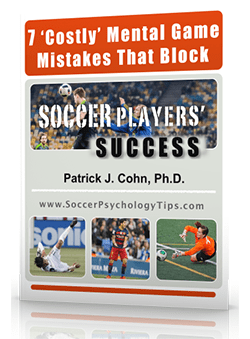 Download our free soccer psychology Ebook “7 Costly Mental Game Mistakes that Block Soccer Players’ Success” and learn how to overcome other mental barriers in soccer.